Drools now has complete api/implementation separation that is no longer rules oriented. This is an important strategy as we move to support other forms of logic, such as workflow and event processing. The main change is that we are now knowledge oriented, instead of rule oriented. The module drools-api provide the interfaces and factories and we have made pains to provide much better javadocs, with lots of code snippets, than we did before. Drools-api also helps clearly show what is intended as a user api and what is just an engine api, drools-core and drools-compiler did not make this clear enough. 'kbuilder', 'kbase', 'ksession' are the variable identifiers often used, the k prefix is for 'knowledge'. There are two new interfaces added, ResourceChangeNotifier and ResourceChangeMonitor. KnowlegeAgents subscribe for resource change notifications using the ResourceChangeNotifier implementation. The ResourceChangeNotifier is informed of resource changes by the added ResourceChangeMonitors. We currently only provide one out of the box monitor, ResourceChangeScannerService, which polls resources for changes. However the api is there for users to add their own monitors, and thus use a push based monitor such as JMS. Since events usually have strong temporal relationships, it is possible to infer a logical time window when events can possibly match. The engine uses that capability to calculate when an event is no longer capable of matching any rule anymore and automatically retracts that event. The above pattern will match if SomeEvent happens between 1 minute (1m) and 1 hour and 30 minutes after $anotherEvent. Process persistence / transaction support has been further improved. Check out the drools-process/drools-process-enterprise project for more information. The "Transform" work item allows you to easily transform data from one format to another inside processes. The code and an example can be found in the drools-process/drools-workitems directory. Function imports are now also supported inside processes. Support multiple runtimes: The IDE now supports multiple runtimes. A Drools runtime is a collection of jars on your file system that represent one specific release of the Drools project jars. To create a runtime, you must either point the IDE to the release of your choice, or you can simply create a new runtime on your file system from the jars included in the Drools Eclipse plugin. 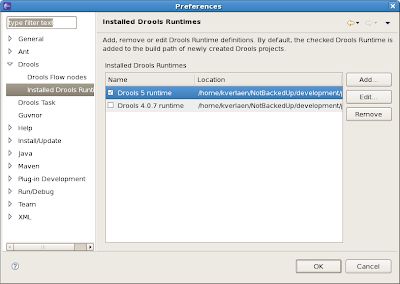 Drools runtimes can be configured by opening up the Eclipse preferences and selecting the Drools -> Installed Drools Runtimes category, as shown below. Well its been out of fashion for a long time, but for some purposes a client side app is really the only answer ! 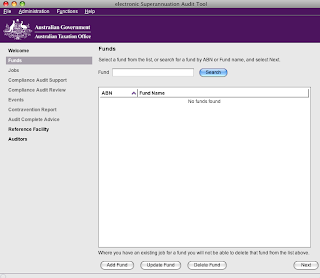 Interestingly someone pointed out to me the Australian Tax Offices "eSAT" application (a multi-platform multi-lingual application for accountants) uses drools - and its a client side app ! Interestingly, they use pre-compiled rules (being finance and government related, they tend to use a fair few rules !) - and only distribute the "runtime" as part of the app. One of the key constraints of this application is that it had to fit within a certain download size (so every dependency had to be analysed to see if it was really needed). So there you go, client side apps are still around - and this one by Cordelta looks like a pretty good one when I tried it on my mac (they have distros for all platforms). The ATO site where the app came from is here. Kris and myself will be at Devoxx next week, we will be co-presenting the University session "Declarative programming with Rules, Workflow and Event Processing". Monday the 8th of Dec, 09.30, room 7. Many thanks go out to salaboy for doing a large part of the work and adding the different factories to create the various types of nodes supported in RuleFlow. This also shows how easy it is to contribute to the Drools project if you want to: come join us at our #drools irc channel, describe what you want to do and we'll help you as much as possible and welcome contributions ! Michael (that's me !) is speaking at the OSDC conference in Sydney this week (Wednesday morning to be precise). OSDC is a community organised conference for open source developers (and end users/organisations). It has a fairly technical focus, and lots of jokes/fun (the lightning talks are usually quite amazing). Last week (very late night my time) we had a "webex" online seminar talking about what is new in Drools 5, followed by a question and answer session. Drools 5 Whats New from Michael Neale on Vimeo. UPDATE: There was a higher fidelity quicktime one - but I burnt through the 2 gig monthly limit in hours (whoops - I totally forgot to read the fine print !). If people want the hi-fi one, I will make it available on another link. I forgot quite a few people read this ! Q: How is Drools Flow different from jBPM? A: A different approach - behavioural modelling, event driven, integrated and mixed with rules. Process model is continually emitting events for the rules to consume. Same API (as rules). Q: Drools5 is currently in MR2 phase. What is the planned GA date for Drools 5? A: M3 will be out today - a candidate release is expected in the first week of December, shortly followed by "GA" unless major issues are found. Q: For long-running processes involving human tasks, how is the state of the process/flow persisted? A: Various approaches available - database via hibernate for instance, file system, all intended for high performance. Working Memories are now transactional and persistable (JPA is also an option). A: Certainly. You can use just rules, no issue. In that specific case with heterogenous environment, you could access the rules as a service via XML or JSON (drools-server) from the SharePoint side (or you could use the ESB, many options). You only need to use what you need for your specific project, it is not monolithic. Q: Are there plans to integrate with Netbeans? A: Eclipse is the developer tooling platform we target currently, however there have been informal chats with Netbeans people on this, but nothing concrete at this point in time. Ideally someone from the community will get involved with this, which would set a clear direction (that is how the Eclipse one started a few years ago). Q: I am fairly new to DROOLS. can I hookup my Eclipse IDE with Guvnor? A: Yes. There is a plug in which lets you explore artifacts in Guvnor. You can also browse the web GUI from within your IDE with this plug in. Q: Does the new Asym Rete reduce Memory usage? A: In some cases (a high end logistics user has reported some reduction in memory usages for very large heaps). For some smaller cases there may not be a noticable difference. The key difference is that fact objects do not need to be "shadowed" - this means the state of the facts does not have to be copied (obviously for large numbers of facts this reduces memory and increases speed). Q: We saw Dynamic Fact model - does this mean for a change in the fact model, we dont have to build and redeploy the rules? A: If you are making a change to the fact model - you will need to redeploy the rules if you want to use the new fields in the fact model (obviously !). The dynamic fact model is deployed along with the rules. Q: Can a model be supplied from an external datasource? A: A declarative model is "drl" source code - so it can come from any source, but must be available at rule "compile" time. But the data to populate the model instances (facts) - certainly ! Q: How is the associated pojo/class created and accessed when the model is defined from within Guvnor? A: Using a reflection-like API (you can also use your own bean-mapping tools - as behind the scenes it is a class that follows the java bean pattern). A: There are several APIs that are used internally to generate rules (and there is the AST directly) - but there is no plan to have the "old" style "pojo rules" which can't easily cope with higher order logic which is common in a rule language. Q: In BRMS 5.0.0.M1, I used to have an "upload" button to add DSL (just like I can upload Model jars). It was removed to just a copy/paste textarea in 5.0.0.M2. Why? A: This was actually a mistake in M1 - it was always a text area (an additional upload may be provided in future if enough people want it). Q: Can the enumarations be picked from a database? A: Yes they can. An MVEL (expression language) expression can retrieve the lists via JDBC or any other means you choose. Q: Is seamless integration with a BPM still possible and Drools 5 can be used just as a rules engine with BRMS (we would not need the Modeling and Processing as we need to integrate with our BPM). A: Yes - as mentioned before, its totally modular and most features are optional (you only use what you need). Q: When using the guided rule editor, what happens when you type a letter in an integer variable field? When is validation done? Also, will there be a date picker for date variable fields? A: It will not allow you to enter invalid characters. Date picker is not available in that editor yet. Q: When defining a fact model object as an analyst, types like "Integer, Boolean, Float" don't make sense to me. Will they be defined or renamed so analysts can understand what they stand for? A: No reason - a bug has been raised to ensure this is corrected. Q: Are java 5+ "Enums" supported in Guvnor for drop-down choices in web decision tables *and* in guided rule editor variable selection? A: No, not at this stage. Q: Can security integrate with other authentication/authorization sources such as LDAP/AD? A: Yes - JAAS is used (via Seam). Coarse grained authorization (admin users) as well as Authentication can work with LDAP and AD (that is recommended). Q: Are user permissions only enforceable at the package level, not by Categories? Once you have access to read/write a package, is everything in that package available to you, or can it be more fine-grained? A: Can be enforced at the category level. Q: Can the workflows (ruleflows) be defined from within the Guvnor (versus Eclipse)? 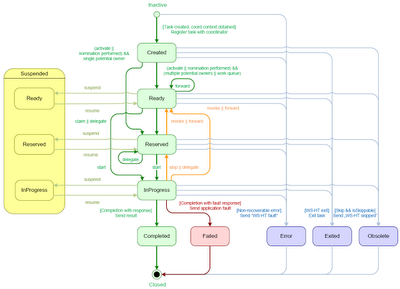 A: Not at present - only viewed (limited editing) but in the near future full editing of flow diagrams will be supported (we are trying out various ajax and possibly flex techniques to make sure we can target all the popular browser platforms). Q: What does a Foo.scenario look like in the eclipse plugin if you open it up? Can you run scenarios from eclipse? Can they be grouped to be part of a continuous build/test nightly process? A: It is XML. Yes you can - using the ScenarioRunner class (from code). Q: In WebDAV, how are user permissions enforced? Can I change or edit rules in WebDAV mode? A: Fine grained permissions are not enforced in WebDAV at the moment - only authentication. Q: Are Web decision tables customizable? A: To some extent - the grouping can be setup, as can widths/names of columns etc..., but not to the extend that spreadsheet based ones are. Q: Regarding security, is it custom in Guvnor, or is it linked up to JAAS LoginModules like other standard apps? A: JAAS. No out of the box authentication is provided - it is delegated to the container. Q: Is security rights defined in the Guvnor also enforced when editing assets using the elcipse plugin? A: Only authentication - as this uses the WebDAV facility (at present). A: You can import - but it will not convert them to web based decision tables - it will simply be stored as is, and used as is in a rule package. Q: Are fact models created within Guvnor versioned Such as source would be in cvs/SubVersion/clearcase . . .
Q: Can rule flows be invoked via a JSR 94 interface? A: Not at this stage. Q: In drools 4 - we had to turn off the AOP - caching because it conflicted with our own cache. Has that whole concept of truth maintenance been re-vamped in drools 5? A: It was highly likely it was the shadow facts (little proxy classes generated to copy data from facts) - these would cause havoc with AOP and other tools. Shadow facts are no longer needed in drools 5. Q: Any Apache Camel or Spring Integration - support? A: There are some members of the community working on this. In terms of spring - there are a few ways people have used it available on the wiki. Q: Web service exposure of the rules is still through custom methods or is there "out of box" functionality to expose them? A: There is an "out of the box" module called "drools-server" which uses the RuleAgent to expose rules as RESTful services (XML or JSON payloads for the facts). A: This depends on the configuration - if you want, yes. Generally though someone with "full access" to Guvnor would create a snapshot for production usage which the remote rule agents then consume. Q: What really is a partition for events? In traditional programming we have shared memory and threads working over that memory. Is a partition like a thread - or is an actual partition of the working memory? Would you please define your terms. Thank you. A: There is some partitioning of the working memory for the concurrent threads handling the event streams - but it is of course one memory space (one java process) - so a partition exists to help this per-thread isolation. Q: Is the goal of Drools 5 - BLIP + BPML + BPEL? A: Not at this stage (for the 5.0 release anyway). BPML has had some interest and there has been quite a bit of work in both BPML and BPEL as popular standards. "BLiP" is really a cute acronym meaning the combined business logic approaches of rules and processes. A: There has been a LOT of work around serialization and de-serialization to make it much more efficient. You should certainly see an improvement here. Q: Are there any integration with rule mining tools such as Relativity? i.e. Go throught the lines of cobol code harvest the rules and automagically import them in drools as a rule. A: No - not that we have heard of (an ISV may have done something along these lines though). A: Not in this version, but that is on the roadmap for a near future version (requires dependency analysis so its slightly more complicated then it sounds). Q: how do we use the binery package for further use? A: You can use the RuleAgent to access the binary .pkg either directly from the repository, or from the file system. So was talking to my friend Benjamin Grosof, ex MIT Sloan Professor, from Paul Allen's cutting edge research company Vulcan Inc. While talking about next generation stuff he introduced me to the concept of Semantic SOA, he personally believes this will be the next big thing. It took a while for the concept to sink in, but once it did I was shocked to my core over the possible impact of such technology. Unfortunately he's twisted my arm, so I can't talk about it further :( But I'd be very interested to here what other people think this is about, and whether Gartner or other analysts have picked up on this yet. I'll be giving a presentation about Drools in general (and some more details on Drools Flow specifically), on the first Belgian JBoss User Group, this Friday November 7th in Huizingen. The event starts at 17h. There will additional presentations from Nicolas Leroux on the latest development methods using Java EE, Seam, Hibernate, etc. and from Alexey Loubyanski on the new features of the upcoming JBoss AS 5 release. As far as I know, the maximum capacity has not yet been reached so do not hesitate to register if you are around and interested in Drools, any of the other topics or just in JBoss in general ! In my endeavours to understand Clips I realised that it's Rete implementation was different to the more classical approach, as used by Drools 4. I haven't read anything in the past that attempted to give this difference a name, so I adopted the terminology of symmetrical Rete and asymmetrical Rete. It was really nice to see this decision validated by Gary Riley, the author of Clips, who used the terminology in his presentation on Rete enhancements in Clips at the Rules Fest in Texas. Here is a quick explanation of the difference, without getting into the details on merit, in Drools 4 we use the classical approach of the retract being the same work as assert, except on the assert data is added to the memory on retract data is removed. By this I mean that the fact propagates through the network, for each join node the constraints are evaluated to determine the joins, the join is made and the fact plus the new join fact are propagated, each propagation into a new join node is added to the join node's memory. The retract is exactly the same, the constraints are re-evaluated to determine the previous joins so that the join and propagation can be remade, this time the facthandle and it's joined data are removed from the join node memory. With the work done for the attract and assert being the same I dubbed this symmetrical Rete. In Drools 5 we adopted the Clips algorithm. Here the assert uses a lot of linked reference so that the propagation creates a chain of tokens. The retract can now iterate this chain of references removing data from the node memories, the joins do not need to be recalculated to determine which facts we joined against, we already know this as we have the references. As the work done for the retract is now different to the assert I dubbed this assymetrical Rete. The October Rules Fest group managed to host the best technical convention on BR I ever attended to, and managed to have not only the most known products and vendors attending, but specially some of the most known researchers in the rules engines field. Take a look at the speakers and the agenda: we have Charles Forgy, Gary Riley, Gopal Gupta, .... you name it! Yesterday was the first day and it was a very good day. 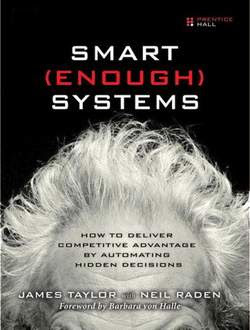 The presentation that most intrigued me was "Why systems fail, Why systems work" by Rolando Hernandez. I need to say that I was not familiar with the Zachman Enterprise Architecture Framework (wikipedia), but when he (and also Dr Leon A. Kappelman in the previous presentation) showed the diagram of the framework, it just made sense. Rolando went a step further stating that Business Rules are not represented as a column or line the framework, but are the glue that binds together all the columns and permeates the enterprise architecture. He showed a "donuts like" hexagram, where each edge represents one of the columns in the framework and the center of the donut represents the business rules "glue". His presentation will be here, when he uploads it. From my perspective, this is something that I firmly believe and matches the Drools vision of a platform that allows you to express your business rules in a declarative way. It was natural then to understand his diagram showing processes and event processing as component models of the whole architecture. Now if you think about the problem, how can you write your rules, or model your business if you will, if your rules engine does not know the concept of events and processes? That is why we, at the Drools team, are working to expand the Drools engine so that processes and events can be handled as first class citizens of your Business Model. If your rule involves events, just state it. If your rule involves processes, just state it. For those not familiar with them, Paul Haley is one of the fathers of current Business Rules technologies and David Luckham is one of the fathers of current Complex Event Technology. There is no way I will miss! Can we get a better endorsement than that? PS: the presentation I did is available at the conference site. T-Shirts Finally Arrived today, so everyone was very excited :) Thought I'd put up some photo's of our motley crew - Asif and Andrea (who have been here the other days) could not make it today, so they missed out on the photo. Just click any of the photos to enlarge. One of the main things we want to offer to end users is the ability to specify themselves what their processes look like. This includes the ability to extend the process engine with custom-defined nodes, to add domain-specific work items, etc. We now have introduced the concept of a (process) skin, which controls how the different nodes are visualized. This allows you to change the visualization of the different node types the way you like them (by implementing your own SkinProvider). BPMN is a popular language used by business users for modeling business processes. BPMN defines terminology, different types of nodes, how these should be visualized, etc. 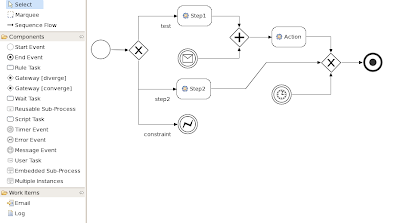 People who are familiar with BPMN might find it easier to implement an executable process (possibly based on a BPMN process diagram) using a similar visualization. 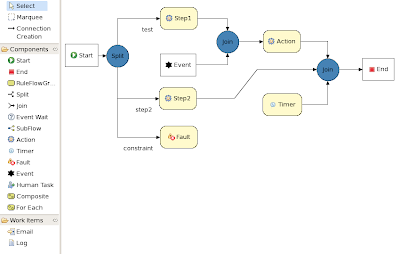 We have therefore created a BPMN skin that maps the Drools Flow concepts to the equivalent BPMN visualization. Tell us what you like! Or more in general, let us know what you think the other features are that are important when deciding how to visualize (executable) business processes (as flow charts). The Boot Camp runs until Wed 22nd of October where the Rules Fest conference starts, which we will all be attending. 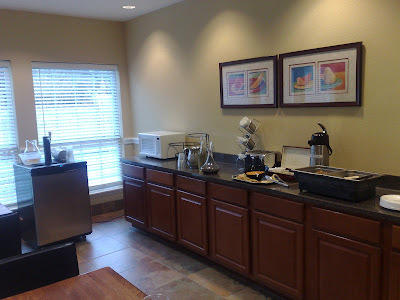 The Boot camp is open to all, so if you are in the Texas area, do please come and join us, we are staying in the Best Western Hotel, Addison. Michael Rhoden from American Franklin. Asif Akram from Imperial College. Andrej Sasko from the independent IT consulting 123Learning.de. Jens Ruehmkorf from German Aerospace Centre is in Texas but is tracking down his luggage, which has been lost, hopefully he will be with us tomorrow. 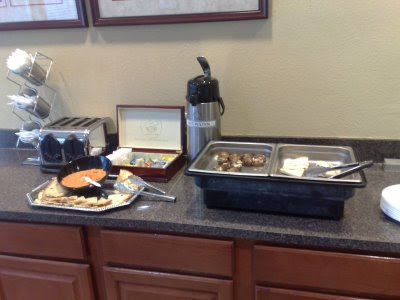 Free food and the beer, the beer cooler is at the square box in the left of the photo. Some more general shots of everyone hard at work. 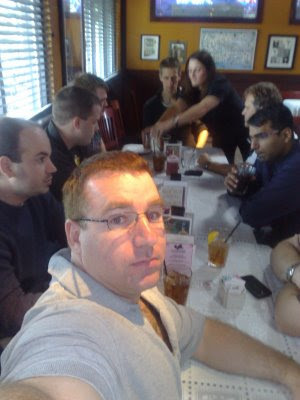 And finally a picture of us at lunch. 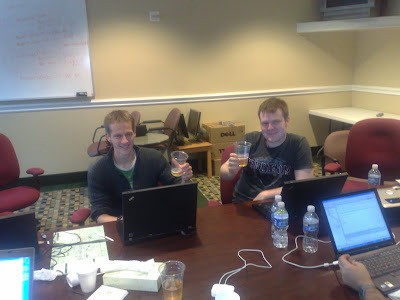 I met up with James Taylor, author of Smart Enough Systems, the other week and showed him over the Drools 5.0 work. He's written a blog entry on his thoughts, which you can read here. The complete JIRA release notes can be found here. Sample Eclipse views allow users to manipulate their tasks. The code can be found here. As a result, new node types and properties have been added to the Drools Flow editor in Eclipse. You can also find examples of these new features in the integration tests (e.g. ProcessExceptionHandlerTest, ProcessTimerTest, etc.). Finally, our pluggable work item approach allows you to plug in domain-specific work in your process in a declarative manner. We plan to build a library of common work items and already provide an implementation for sending emails, finding files, archiving, executing system commands, logging and human tasks. Drools now supports "fireUntilHalt()" feature, that starts the engine in a reactive mode, where rules will be continually fired, until a halt() call is made. This is specially useful for CEP scenarios that require what is commonly known as "active queries". Drools ReteOO algorithm now supports an option to start the rule base in a multi-thread mode, where Drools ReteOO network is split into multiple partitions and rules are then evaluated concurrently by multiple threads. This is also a requirement for CEP where there usually are several independent rules running concurrently, with near realtime performance/throughput requirements and the evaluation of one can not interfere with the evaluation of others. This is a big topic and has several implications that I will discuss in a follow up blog post and the upcoming documentation. Drools now supports XSD models, you can look at the unit test here to see how it works. Remember though the XSD model is generated as pojos local to the Drools classloader. A helper class is there to assist in the creation of the model in the packagebuilder. Once the data model is generated you'll typically use the JAXB dataloader to insert data. Drools now supports two data loaders, Smooks and JAXB. Smooks is an open source data transformation tool for ETL and JAXB a standard sun data mapping tool. Unit tests showing Smooks can be found here and JAXB here. Create, Claim, Start, Stop, Release, Suspend, Skip, Resume, Delegate, Forward, Complete, Fail. Task Initiator, Task Owner, Potential Owners, Business Administrators, Excluded Owners, Recipients, Task Stakeholders. Already it's obvious that we have rules and flow involved here. To give you an idea of the business logic involved lets look over some of them now - obviously the spec pdf has the complete set of business logic. The task starts off as Created and then moves to Ready where it can transition to Reserved or InProgress depending if the operation is claim or start. Only potential owners or business administrators may claim or start a task. Once in progress only the owner can fail or complete it. Potential owners can only forward a task if it has a status of Ready, once Reserved or In Progress only the owner or business administrator can forward it, further to that the person forwarding must be specified explicitly in the permission and not implicitly as part of some group. The first thing that came to mind was "great we can model this with rules and flow using Drools" and after some thought I decided that Flow was a bit over kill for this as the flow was quite basic. Also flow diagrams can obscure the business logic, making you need to inspect each node to get a full understanding of the logic; if the flow is simple I think I'd prefer something that made the business logic more obvious. So I decided to defined a DSL that would define both the flow and the rules in a single way, that was also "self documenting" and that made it obvious what could be done where. I decided to use MVEL to model the DSL, as it allows for compact and minimal syntax when creating large graph objects. So lets look at what this DSL would look like. We know that we first have an operation command (claim, start, stop, etc) and that those operations are only valid when the task is in given status, someone can only claim a task that is in the status Ready. Further to that we have allowed permissions, who can execute that task for the given status, only potential owners or business administrators may claim a task and then we have the resulting new status, which in this case would be Reserved, and the owner of the task must be set to the new user. Notice MVEL uses the "." suffix to allow in-line "with" field accessors for very compact syntax. What the above says is that we have a Map of possible operations and each key has an array of possible OperationCommands. In the above case there is only one possible status Claim can execute on and that is Ready. See the difference? Any potential owner can start a Ready task, where as only the owner can start a Reserved task. So what we have here is a self documenting DSL that is easy to understand and easy to administer. In reality WSHT gets a little more complex than there, where operations suspend and resume need to track previous status and as mentioned previously forwarding has an extra permissions check, and delegating will need to execute an additional command to also then Claim the task in the delegates name. The following links are for the full source code for OperationCommand and the operations-dsl.mvel. Having written the DSL, forgoing Flow, the next question was - how do I write my rules to process the DSL. Given some more thought I realised that the rules where not large nor complex and the domain was known, in that they will not change often. further to this the data used with those rules is minimal - do I really need a rule engine for this? The obvious answer is no, I can hand crank some minimal Java code to process this DSL. The full DSL processing code can be found in the TaskServiceSession source code. When the problem domain is well defined and known, try and design a self documenting DSL to represent the problem domain. We don't always have to use XML, you do have a choice. Typically the dsl is going to be authored through a custom GUI, or just edited by the develop by hand. So why not keep it simple with a nice compact syntax, which will help with the "self documenting" benefits of the DSL. If the Flow is simple, we don't have to use BPM software. Some times a DSL can be less verbose and provide more upfront visual information. 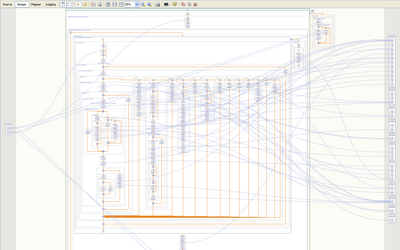 Further to that a DSL encapsulates the flow and the rules in a single format. If their are a small number of non-complex rules that don't change often and don't require dynamic deployment with a small data set that won't benefit from indexing or from optimising of data changes over time, maybe we should just write a few hundred lines of java code with good unit testing. The number of research projects around Drools is growing, however I've noticed that institutes are generally not aware of each others efforts. For this reason I'm launching the Drools Research Network. This consists of a web page (synced from a wiki page so anyone can edit) that shows all the University stakeholders in Drools and the various research projects. Please do help keep this page up to date and comprehensive. There is also a mailing list that is strictly for institute staff to discuss existing and potential projects, fundings, students and general collaboration to increase and improve Drools related research - if you fit in this category please subscribe. Michael Zimmermann, from Rostock University, has emailed us an overview with findings for his Phd thesis on helping to improve the navel engineering process using Drools. The thesis title is "Knowledge based design patterns for detailed steel structural design". from classification societies etc. exist. This means concurrent design, i. e. different people are working on parts or features that are closely related (strength, fatigue, cost, functional aspects or just being in the same room) on different levels of granularity (changing the hull 6 weeks before building happens!). No connection between design intent (specification on paper), design conditions (regulations, by the customer, results of calculations) and design solution chosen. The objective of our research is to make the design process context aware. Example: If I design a "door" in a watertight "wall" the cad system should check whether the selected door is a watertight model. So, using one of the most popular commercial cad systems for naval engineering the approach is to define the standards (currently paper-based) electronically using DROOLS. Also, context-information like watertight, stress level=x ... is added to the model and reused in the design process. For standard design tasks (in a part of the field of detailed steel structural design) we use drools to completely automate the design process, i. e.
Defining the context a solution is valid for is even more difficult. Current CAD systems in naval engineering are not really capable to store meta information and to interface with other applications. Not drools is the problem but getting the data in and out! An OWL/RDF binding would be really great (we use OWL to define, edit, store our standards. But encountered the clash of open world logic (DL) and closed world logic (CS) more than once.) I know there is quite a large interest for such a solution in the Ontology user base. Better support for constraint programming (what we do here and there) for simple primitive cases (read: selection processes) would help. Drools solver is overkill; drools rules can not handle this if you think optional constraints. The custom operator "== (open world style)" we talked about helps, though. I've previously blogged about how Drools is becoming a Business Logic integration Platform that unifies rules, work flow and event processing. An important aspect of work flow is human task management, which to date has been missing in our efforts. Kris Verlaenen, the Drools Flow lead and general evil genius, did a review of the various specs and other non-standard implementations. As it turns out the WS-Humantask (WSHT) spec is pretty decent and comprehensive, the pdf can be found here, so when thinking about implementing this feature for Drools it made sense to base it on WSHT rather than a proprietary implementation such as the one found in jBPM. WSHT has become an oasis standard, which InfoQ covered back in january "BPEL4People and WS-HumanTask Head To OASIS". Kris has been busy working away on a implementation of WSHT and it's almost at a usable stage, for now he has taken a more practical approach to this to deliver something that we can use for Drools, rather than just aiming for WSHT compliance. Although we do hope to eventually make this fully WSHT compliant, hopefully someone from the community can help us from that side. The class model, which is made persistable through EJB3, is close to complete and able to represent the whole of WSHT - except for the presentation elements, which I have left off for now, these can be easily added later but we don't have much use for them yet. For now we have chosen to do ignore the WS aspect and focus on a apache mina based client/server architecture this allows us to create a simpler and lower latency implementation for integration with our runtime and tooling, easily supports p2p and is more easily embeddable as mina is just a small JAR. The last one is important as the WSHT server needs to message events to running clients, who are typically in a wait state. The spec does not specify anything about iCalendar notifications, so kris has added this anyway. So now when someone claims a task they get two iCalendar emails one for the first start date and one for the last start date. iCalendar VEvents was chosen over the more symantically correct VTodo as there doesn't seem to be much support for the later - neither gmail or zimbra can detect a VTodo sent via an email. Maybe over time we can make this configurable and users can specify whether they want events or todos. Typically a Task has a start by date and an end by date, WSHT allows for multiple start deadlines and multiple end deadlines. Each deadline can have zero or more escalations that result in a re-assignment or a notification. WSHT doesn't specificy what form the notification takes place, this is one of their extension points. We have hooked up the notification system to integrate with our existing "work items" framework, initially with the email work item. Work items are pre made units of re-usable code, typically with GUI configuration in the flow editor, for executing actions. Later we could include a JMS or WS notification, leveraging any pre-made work items we have made. To get an understanding of how the WSHT life cycle works with the various allowed operations the spec pdf provides this state transition diagram which hopefully makes it all clear. The Drools Task code currently lives here, while the WSHT client/server implementation is close to complete the tooling integration will be minimal for 5.0 due to time constriants. We hope to quickly crank that up to make the tooling in eclipse and the Guvnor BRMS feature full. This is a great project for anyone wanting to get involved as it's relatively self contained and thus straight forward and no complex algorithms :) Things to do include full WSHT compliance, improved tooling including various extensions like inbox style views that support task labelling and also "read" status. 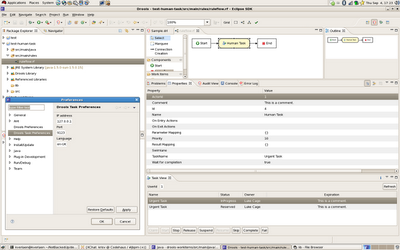 For now here is a simple screenshot showing some of the minimal Task tooling integration into Eclipse.